We don’t even need the excellent “Wireshark Display Filter” cheat sheets from packetlife.net anymore (well, Jeremy still has a lot of other, really helpful cheat sheets, so check them out). This will result in an absolute TCP filter, including both IP addresses and ports. Unfortunately, the developer version 1.99 of the coming Wireshark version 2.0 still does not have this pop-up menu option, so I’m stuck with 1.12.4 for the time being. Filtering for the packets of a TCP three way handshake may sound like a simple task, but it isn’t. The first two packets are easy, because those are the only two that have the SYN flag set. To find these, simply filter on “tcp.flags.syn==1“. But what about the third packet? It has only the ACK flag, but that’s also true for all other packets following the handshake, so we can’t just use that flag (at least not alone). 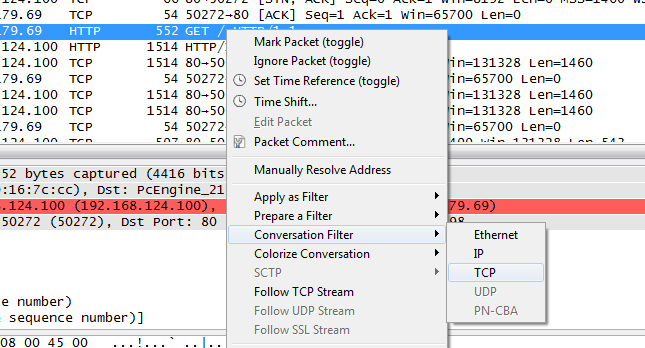 Now, Wireshark beginners often try to find a filter expression that looks at packet dependencies, e.g. like “filter a packet that has a sequence number equal to the sequence of the previous SYN packet of the same connection plus one.” – and such a filter does not exist. You simply cannot filter on things in two different packets at the same time. Filters always look at a single packet at a time. We know that the sequence number is one higher than in the SYN packet. Since the initial sequence number is random we would have a problem, but fortunately, Wireshark offers relative sequence numbers (turned on by default). This means that every SYN has a relative sequence number of zero, and the third packet will have a sequence number of one. So we filter on “tcp.seq==1“. And since we must have acknowledged the SYN/ACK from the server we know that the ACK number must also be one, which leads to a better filter: “tcp.seq==1 and tcp.ack==1“.Unfortunately, many packets can have a relative sequence number of one, because if the client (which initiated the connection, thus being the sender of the first and third packet) does not send any data (e.g. when receiving FTP-Data), the sequence will stay at one for the whole connection. So we need more fields to filter on that only appear in the third handshake packet. The next problem is that this filter will also show all empty ACK packets where we haven’t seen the SYN and SYN/ACK packet in the trace (because they weren’t captured early enough), so we need to find a way to make sure we only accept ACK packets where we have the SYN and SYN/ACK in the trace. There is an easy trick to do this, but it only works since Wireshark version 1.12 and later: Wireshark 1.12 is the first version to calculate initial RTT for all TCP conversations when it has the full three way handshake. So if the iRTT field is available, we know that we have seen the SYN and SYN/ACK packet. The final filter for the third handshake packet is: “tcp.seq==1 and tcp.ack==1 and tcp.len==0 and tcp.analysis.initial_rtt“. To filter on all three way handshake packets: “tcp.flags.syn==1 or (tcp.seq==1 and tcp.ack==1 and tcp.len==0 and tcp.analysis.initial_rtt)” – keep in mind that this will show the handshake packets of any conversation, so there may be more than one set. If the filter doesn’t work for you, check if you have enable absolute sequence numbers. You can identify those metadata fields easily since they’re written in square brackets. Many other protocols have similar metadata fields, helping you with finding the matching request/response pairs, so if you need to filter on those, look at the packet decode to see if there are any that you can use for the protocol you’re looking at (e.g. DNS). So we can just filter for all ICMP echo request packets where the “response in” field does not exist, and find all unanswered pings: “icmp.type==8 and not icmp.resp_in“. There is also another metadata field that explicitly states if no response was seen, so you could filter for that, too: “icmp.type==8 and icmp.resp_not_found“. Some problems are better solved with tools other than Wireshark. Think of duplicate packets that were captured on a SPAN port with multiple source ports – Wireshark can’t tell duplicates apart, because they’re the same, byte by byte. There’s just nothing to filter on that would tell the difference. In that case, use editcap instead, which comes as a command line tool with Wireshark. Or you might try to compare two captures taken at different locations – it’s not really possible to filter for things like “packets that are seen on one side, but not the other”. Instead, you could export the conversation statistics to a text file or a comma separated list, and compare the two exports with a text diff tool to see where the differences are. Just make sure the sorting is the same for all files, or it will be hard to work through the lists. If you try to filter on something about packet relationships you need to find fields that allows you to do that by just looking at a single packet at a time. Often, others had the same problem like you do and a merciful developer added a metadata field that helps, so you can filter on that. Most request/response packet pairs contain metadata references to each other, so you can filter on those. Another quite basic task is tcp retransmission troubleshooting. It is a simple thing to create a filter showing us all tcp retransmissions (“tcp.analysis.retransmission”), but we may also want to see if there is the original TCP packet with same sequence number as the retransmission. This is important to prove that the packet was dropped on a different network segment. So we would need a filter showing all retransmission AND the original packet with same seq number as the retransmission. I found no way to do this in wireshark/tshark, so I wrote a shell script with a loop to filter based on another filter –> but this is awful slow…. yes, that’s a typical example. Sometimes it would be nice to be able to filter and see related packets, but at the moment this can’t be done within Wireshark itself.